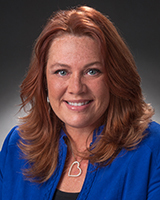 Nancy Rials Lasuzzo joined Vintage Realty Company in January 2012 as a Senior Property Manager with the Commercial and Healthcare property management departments. Prior to joining Vintage, she managed 500,000 square feet of medical office space with Lincoln Harris CSG in the Dallas market for HCP, Inc., an S&P 500 company. She has over 20 years commercial property management experience including office, retail, industrial and medical office buildings. Nancy received her Bachelor’s degree from Louisiana Tech University with an emphasis in Business Management. She obtained her Certified Property Manager (CPM®) designation in 2007, and holds a Texas Real Estate Brokers License and a Louisiana Real Estate Associate Brokers License. She is a member of the Institute of Real Estate Management (IREM®) and has served on multiple committees within the organization.